I'm a new player in this wonderfull game (well, elder new, i've have the game register on my google account since 3 years i believe). 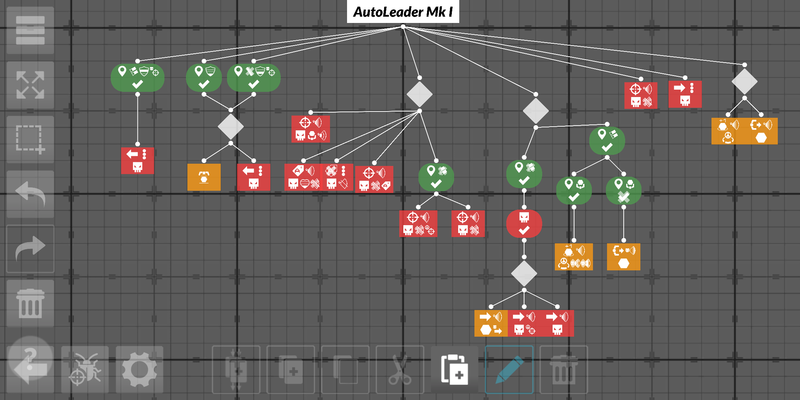 For the moment, i have make this AI and passing the campaign easily (chapter 5 for the moment). I just wonder if i can make it better (yeah, i know, you can always make it better ^^). First of all, thank you for sharing your work with us, to be honest there is not a lot of up to date content available for the moment so it's nice to see others people view of the game. My current AI is also blocked at the level 5 of the chapter 5 (and 1300 in the arena). So i did copy yours, hope you don't mind. plus it doesn't feel possible at first to finish campaign only with Assault. Do you try to keep your scheme with the lowest node possible ? I'm quite impressed, because it really did well in the first level of the Chapter 5 when I've tried it. I'm currently struggling with 80ich nodes or something, I might be doing something wrong ! It feels like this AI is only made for campaign, do you use it for Arena as well or do you have separate AI ? Some stuff in your implementation still bugs me, You focus your fire after you chose your target and not the other way around ? You do some targetting then some grab/move then some targetting and then some move again, why not to group them ? 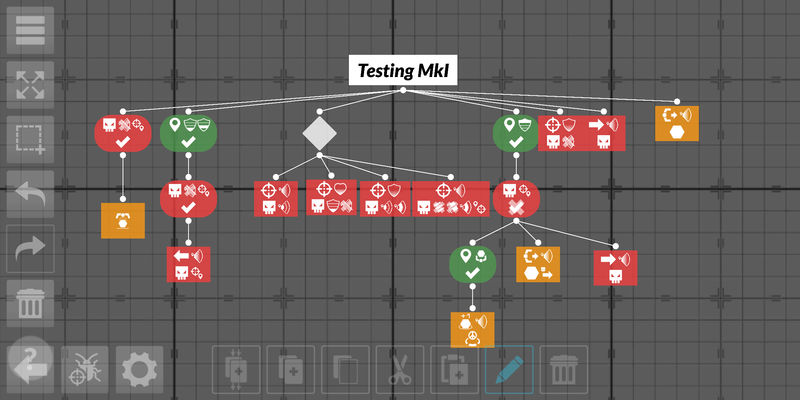 I'm using a mix of bot (always trying to go with only assault first, then change if needed) but with some "experimental treee" for the other AI. I don't play at all on arena (i never play competitive game, even in overwatch ^^) so i never have to face too "human-ish" AI. And for the few node... I'm really new in this game (and never ever get my hand on coding) so i try to keep it simple, for my own comprehension purpose ! To many node (and twist) is bugging me ! This is why i make mistake. Thanks for lighting this ! On the other hand, i have huge trouble to understand the right path of the target system. As Peasant say, they change a lot of target and make this build sometime less powerful than i hope. Oh! thanks for answering my questions, it make a lot more scene now. If you try some other units, even just once in a while, then you should really decorate your tree with some self check on bot class cause targetting and focusing your fire varies a lot with the class ( look at the AI class aware bot in the tutorial for example) and then go to the arena it will teach you a lot and its fun ! In that order (attack enemy i'm already attacking) you want your bot to check if he should keep firing on the bot he previously targetted or if not look who to target next. Layers are doing great so far (as its always do in programming), it allows you to isolate the bot behaviour, so if he does something you don't like (or an unexpectedly good thing) it's easier to debug, understand, modify. 8 videos that really helps me a lot. The modification made in the retreat are just rubbish, I wanted your bot to stand more in the fight. but this is just a quick test. This bot goes form chapter 1 to chapter 3 right now. The real point his how the bot his cut now into section that only old certain type of action node. Wow, nice work with your AI ! I will look at the youtube chanel ASAP too ! For the moment, i just launch miself in the ladder, and with this AI i'm right now in the gold league with 1 bot of each. For the moment, i'm not totaly ok with the behave of the "shotgun" bot. Before everything what i did with your AI was just an over exaggerated version of it to make my point about cutting things (and a good example of what not to do to retreat! ) and separate scoring and catching is probably a bad idea anyway. About yours, its good over all, a very good start i think plus a lots of good things you can start to work on. Oh and yes you don't like your shotgun yet, of course it's the most complicated bot class (i think). But he is the only one to do what he do. and he can do a lot. so learn to cherish him and he'll soon become your MVP. Now some though for your AI. Shotgun is a coward he needs to flee more, two enemy targetting him, bam! you run, but come back quick to disrupt them again. Don't try to make him engage combat at medium range too often he is good at short range but if you put him too much in danger he dies in a blink. Machine gun his tanky as hell, so not bad at caring resources at some point in the game (close to a resource and to an ally base, don't drop your resource too quick cause he gonna score anyway) and don't need to make him flee too much (like you already started to do). Sniper should stay and engage fight at long range and should also try to bring support to his friends in needs. (it's the bot class that a know less about for now so I don't have a lot of relevant things to say about him). I post this, because I realise all the bad ideas I had about possible good practice to make a good AI or whatever. 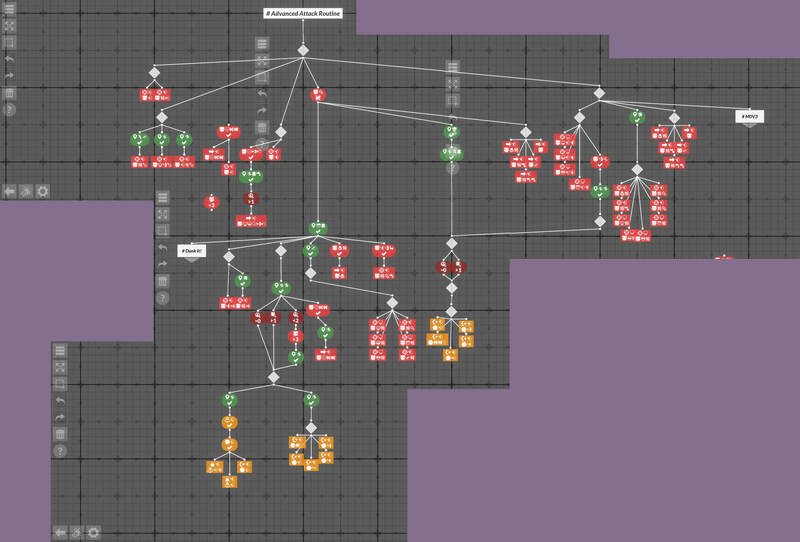 at the higher part of my AI as sort of "layers" or whatever is stupid as well, and a very limiting idea. So don't go for it, even the "if myself attacked" for retreat is not that great. So now I'm gonna have to restart from scratch. I work on a brand new AI (named SCP, free ressource for the one who catch de reference). I will post it later, but for now, i've realy enjoy it and it's fun to watch ! In the spirit of sharing (right click and view in new tab to see full version).. Here's my attack code that reached grandmaster league. The retreat code requires more work before I can share. I'm not realy happy with, there is major flaw in my game but for the moment i can't see how update it. If myself was attacked by at least 3 EI tag myself 1. If myself tagged 2, avoid contact and gather ressources until my score was superior at the number of ressources left. Suggestion. Until GM (I would say, nowadays at least, up to 2100+) you may consider to avoid using tags. Not because tags are not allowed or such. Rather because the task to produce a good tactic (n1) is already hard in itself, adding too many complexity layers (see tags) creates a more difficult task. Once the core tactic is there, you can go to find refinements. If, on the other hand, you have fun using tags, independently from the result. By all means have fun! Great work, keep going like that, your AI is simple and your layout is clean, cut and well organised. It's easy for everyone to read and understand it. I agree with pier4r, you should not be messing around with tags for now, there is no need for this. a better core strategy is the key. Just a little reminder that few days ago, coding was some sort of wizardry to you, and now you fight in higher league a good proof that this game is for everyone. ps: nice KiNASuki and thanks for sharing. I like the concept of the tag, but not used them like others in higher league but i found it fun to play arround for learning purpose. For the moment, my main issue was the "pushing" part and by following, the gathering. As I do not push enough, I do not occupy the field enough and my opponent is free to gather as he sees fit. But if i push more, i loose my bot. First check if your bots don't switch targets when they shouldn't. Split fire and prioritize enemy sniper. Then refine retreatment taking into account how many enemies and of what types are aiming at bot.